Gives one hope that not all the world's following the devil like DC most assuredly is! Impossible to articulate and really share the feelings of the morning sky with you. They are mine, but maybe the following musical interlude will give rise to a little peace in your day, too. Have a good one, everyone ... the porch is yours! We are up north at the beach. The sun over lake huron yesterday made everything sparkle. I took a picture of it from our deck, but I'm a lousy photographer and couldn't do it justice. I don't even have the sky in the picture which was really blue and clear. The gray is way off in the horizon, and the glistening was below and the blue above. Long story Smiley, best I got. Morning today is cloudy and gray and the lake is roaring. Supposed to clear up and become sunny and in the high 70s as the day goes on. Iceland Air has $99 dollar one-way tickets to Europe. This is from Detroit, but I would guess it would be from other hubs too. thanks for the lovely photo reminiscent of our old place on Washington Island in Lake Michigan where i spent care-free days tooling around in a johnboat catching perch mostly in the large harbor. A soft rain started a few minutes ago, we've lots of it this summer which is alright by me, keeps us cool. Wow, again, i see great prices from Detroit to many European cities; tempting, isn't it? Hoping you can take advantage for another visit with grandson! Enjoy the glistening lake today and cheers for sharing. on the water, which is always a sparkling joy. Thanks for those fares, too. I have never been to Barcelona, but Amsterdam is so beautiful (even without pot). You got me reminiscing and daydreaming at the same time. So nice. Have yourself a wonderful day, and thanks for all the good morning tunes, too. breakfast of grits with an egg and local wildflower honey; yummy. Yep, my email rings away, though i do have it partitioned; don't have any extra cash for politicians, anyways and would only support individually if i had. Am making progress fomenting plans for trees; if just in a simple way. Glad you like the tunes and may the road deliver little nuggets of joy to you two this weekend. and treasured friends. Almost everyone else else gets the same address I give the likes of LLBean. Just a thought. Works very well for me, but may not for you. emailing the new addy to everyone in your existing account who you want to welcome into your double secret email account and only those people (which is easiest to do from your existing account, which already contains all their email addys). If you're as, um, inclined to treasure leisure as much as I do, you can include in the change of address announcement a request that each of them send you an email to you at your new email address so that their email addresses will get into the address book of the new account. Morning Smiley - smoke cleared and to see a normal sunrise was comforting this morning. Read an interesting article thought I would share before heading off for the day. Those were the days, during the Cold War 1960s and 1970s, when the earth was actually ruled by rock supergroups – from Cream and Led Zeppelin to Yes and Emerson, Lake & Palmer. Good to see you and hey, leaned this morning through dk, that Europe's only $99 bucks away and maybe with new currencies, Istanbul could stretch my SS checks. Thanks for posting and have a great one! lingered. Now, you should know that there ain't a thing wrong with your articulating skills, nor your musical accompaniment picking skills. To the contrary, poetry seems to flow organically from your keyboard and the music was evocative. FWIW, a very ecclectic trio of music vids: The first is best for music ; the second is best for the aptness of the lyrics and the third is best for the hell of it. Have a great Saturday, everyone. and the orchestra and Simone; playing now; thank you for your kind words and good spirits. Funny, on the morning walk, i'd only made it a few feet, maybe 20, going north when the wind stroked me turning my head east to the eye candy. Thanks to the wind, i needed that, so sat awhile on the bench. "Sleep in peace when the day is done ... it's a new dawn ... feeling good." The sky sings to you and the wind strokes you. Sounds similar to First Nations anthropomorphism. I am glad the forces of nature are being kind to you, dear smiley7. frankness; writing is like "dredging a river," as Newman said about acting and now that my mind has wandered there, "I think i'm better when i move," as the Sundance Kid said. Thank you, Janis. Always good to see you. Good day. I don’t have a swing, but the porch chair lean back stop broke facilitating full recline. I think things are returning to normal. I need to swing by the brew pub to retrieve my debit card. Try to keep cool. Shalom. journey; maybe the end of the month as i have to travel to the hill. Full recline; now that can be good or bad; depends on speed, i suppose. Read that's you've been enduring that "after-the-show-finishes," feeling. In experience, i think it's natural. Mind and body need rest. sacrificed it on the altar of Hillary with females support Sanders only because they want to be "where the boys are." Albright, too. "Hillary got me my high prestige job, so now I can tell all women that a special place in Hell awaits them unless they vote for Hillary. As tone deaf and arrogant as the Deplorable One herself. flow in reading and listening, a worthy tribute touches my heart in motivation to do so, too. And as you write, "yet, the sun did rise." i humbly offer Maya's rising poem in tribute to Aretha and everyone. Good to go see you, and thank you again for bringing this moving read. Remind me of the flight of the bumble bee. It was a theme song for some spy thriller in the 60's, adapted by 'real serious musician' types for conditioning us to believe the classics were rubber gaskets to our musical associations, or some such. Thanks Smiley. You always make me smile internally. your words brighten the afternoon; thank you! Cheers for being here in hopes you've a wonderful weekend! I hope the morning hues and breezes continue to enchant. Those are the kind of experiences that I live for. The painting is also enchanting. The empty park bench makes me think about all the special moments that occur, even when nobody is there to witness them. Good to see you, and a happy weekend in return. of the depth of feeling the land can evoke. Definitely one of her best! and didn't want to step on that conversation, but, wow, incredible news to me, sure Henry will enjoy. Afraid of crossing the tracks and the white woman and the discipline demanded in piano class and the money running out at Julliard ... how traumatic that would have been to endure. Damn, i marvel at the fortitude, strength, courage, talent and that special genius so many human beings like Simone most certainly possess in order to survive and rise to excellence against all obstacles. Gives one pause. Hope our college kids are encouraged to spend a period of years reading memoirs and biographies, as like Simone, they will find incredible wealth and understanding. Thanks so much for this follow-up! I too wish that these most inspirational people are forever visible and appreciated. Aren't we fortunate to have grown up with them. was so special as to not be believed. You always bring the best music! I'm glad we share musical appreciation, as well as others. @janis b begs an imaginary soul to sit awhile, contemplate the potential fullness of the moment, come up with a solution to solitude shared by the natural surroundings. I believe the trees, bushes, birds and grass speak to us, if only we could learn to listen with care. It's the most beautiful language of all. I'm still practicing the art of listening and speaking it. #8 begs an imaginary soul to sit awhile, contemplate the potential fullness of the moment, come up with a solution to solitude shared by the natural surroundings. I believe the trees, bushes, birds and grass speak to us, if only we could learn to listen with care. Probably not the best version, but flight of the bumblebees is similar, in some peculiar way. shake the memory, thank you. The water talks to me, especially, if only i could interpret all the tunes. Thanks for the good news. Hope all those women can make a difference. 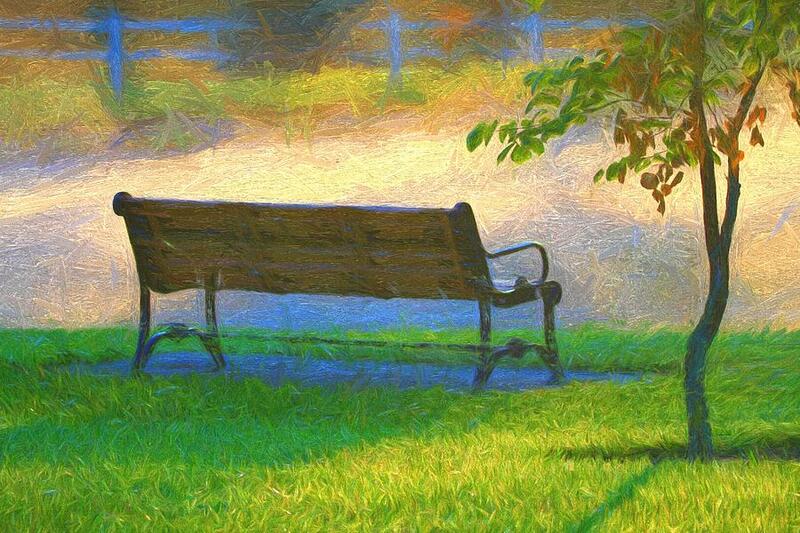 Love the image of the bench - a place to sit and look and listen and nothing more. Sounds good to me. Those spiderwebs and cacti guard the path, don't they? Enjoyed the image on photo Friday. Benches have become closer friends these recent years although i do recall other periods of contemplation when young and searching and immersed. May Mexico lead the way. Thanks for reading and being here. No words, just big smiles here, cheers! a kindergarten variety in comparison. Guess we have to give it up and realize our children don't learn enough modern history so all could understand the simplicity of socialism. Thank you for being here and for the link. poetry and art. And the music of others as well. Texas used to offer bulk native tree seedlings at a fabulous price. 25 years ago anyway. Could not find any current information, but it seems like there are tree seedling giveaways now and then. Maybe there is something in your area? A plan beginning to materlize if i can motivate a few local friends as we have this greenway, miles long and the headwaters of the New River running through it. Before the crash, a good town engineer and grant writer, refurbished hundreds of yards including riparion growth; but that leaves around 10 miles that could use some trees. Now the trick seems to be in engaging the council and or other local organizations into a tree project; apparently, i've just learned a local craft brewery already donates a portion of their income to planting trees. More questions to ask, but feel good about it. Talked today with a fisher friend and lifting an idea magiamma gave us on Thursday, we may root some willow trees, personally. As always a pleasure to see you in hopes you've a great evening! or is subjected to by way of the internet, yours has to be the cutest! I ordered some tree seeds from treeseeds.com just now. Kiwi, Bamboo, Fuji Apple, and it might be foolish, but Dawn Redwood. I have saved local tree seeds I would like to propagate as well . . . Texas Lilac, Golden Raintree, Redbud, and Crepe Myrtle. I met this woman at Harbor Freight last week who starts seeds using aquaponics. She says it is so easy. Easy is a very attractive gardening word in my mind. I am into the idea of planting lots of trees as well, especially fruit and nut trees. Shade trees too. @mhagle Reminds me of that skinny leonard song " You got it made in the shade honey, but don't let that tree fall down on you." Which never made much sense to me. I'm a shade tree philosopher, have more maples and pines than patches of grass, oaks and chestnuts, dogwoods and arborvitae. The sun is only welcome in the winter months, when the deciduous varieties drop their mulch for the gardens. It's alot of work, the compost pile out back is bigger than the barn. But the birds, bees, flutterby's and critters love it too. you have, it is more challenging than here. Fortuitous you met the good lady, no? Hell, maybe we plug a hole or two for the children; won't unless we try, a bonus to enjoy the mystery of growth, anyways. If i haven't said it before, sure do appreciate all the projects, ideas and caring you bring to us all. Too late for me to read the links in your new essay intelligibly; hope to do that tomorrow and catch up. Jake Tapper interviews Kellyanne Conway and Robby Mook. And unlike usual network TV, they actually get to answer without being interrupted. Now it’s August 2018 and it’s instructive to view or re-view. Speaking for the Democrats, Robby Mook is already pushing the untruths about “fake news” having swung the election and “17 intelligence agencies” agreeing “foreign aggressor” Russia hacked the DNC server. Two years later, that’s still their story and they’re sticking to it . . .
You know what? As bad as Trump is, I’m still glad that Robby Mook and who and what he represents lost. Robby Mook lived up (or down) to his name. Then again, the Clintons clearly were the true heads of both her losing Presidential campaigns. Still, if were named Rob Mook I wanted to be a high profile political guru, I may have either reconsidered my career choice or changed my name, first and last. anyone; how pathetic for Harvard's reputation and standards which have been on a downward spiral most of my lifetime, imo. and the NYT, now seem worthy of contempt. The answer was that a connection to Harvard might be an advantage on a resume. Since all the people who were asked already had high-powered jobs, this was a joke, one might assume, but it wasn't. Just plain old tone deaf hubris, trading on a reputation that perhaps had once been earned, but since had been frittered away in the service of the establishment. been around 22 years since my last visit taking my son to Boston for his high School graduation gift. One of my short list of favorite American cities. Witnessed the corporate creep into our institutions first-hand at the Hill; which also has nose-dived since the sixties; damn the politics of money. Right on--loathing of Clinton was greater than love of Trump. will be camping out at medical facilities off-and-on next few weeks, so, participation will be a little spotty! However, considering that I'm still trying to 'learn' how to post Tweets, thought I'd leave you Guys with a photo of a totally precious pup. Fingers crossed that it'll post. Hope you're doing well, and that you've had a good weekend. If I can, I'll see you Guys next Saturday. Stay cool! by my side. Sorry, i missed your post. Sending vibes of healing, good thoughts in hopes these hard medical times ease up soon!